As 2010 comes to a close and 2011 lies on the brink of the future, I find myself reflecting a lot on the past 12 months of my life. I've had a tough year in many ways. I've struggled on many fronts. I've learned a lot about myself, about what I need to work on, where I need healing, how I need to proceed in the future in dealing with certain issues, etc. In short, I'm a total work-in-progress. Add to that the following confession: I'm afraid of becoming what I call an "Awkward Academic"! 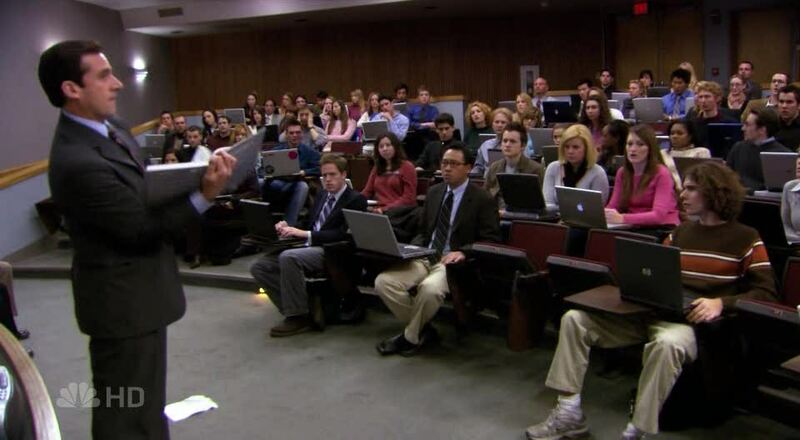 I illustrate this with the picture of The Office's Michael Scott lecturing at "The Temp" Ryan's Business College. In that episode, Scott just bombs because he totally cannot relate to people. His social skills are just terrible, as are his teaching skills! You know what I'm talking about don't you? The teacher or professor or researcher who thrives in the academic world but struggles in every other area at life. I fear becoming the educator who lights up when standing at the head of classroom but is unable to hold a one-on-one conversation with folks. I fear becoming the instructor who comes to life when sitting on a debate panel or in front of a t.v. camera but lacks the ability to be sensitive to how people perceive me and therefore fails to have any type of fruitful relationship or ministry with/to them. I fear being a widely published author or esteemed presenter only to not be able to "get" jokes or always take myself and others too seriously. I fear these things! I do not want to be the "Awkward Academic"! But I must admit something else too: The further I get into the academic world, the tougher it is to tame my conversational approaches to people. Let me explain. The academic world is its own culture. In fact, there are many sub-cultures in the academic world. The sub-culture that I am a part of, the culture that I spend the largest amount of my professional time in is in the field of biblical studies. In this field, there is every type of personality imaginable. But in this world, to "make it" you are expected to produce good research, be a good writer, offer good publications, be a sound presenter, have good debate skills, etc. This spring, I will have presented over 20 academic papers at academic conferences. All of these conferences have similar protocol and expectations. Here's how it typically works: 1) I spend time researching and writing a paper that will make a new contribution to the field of biblical studies; 2) This means that I will have to challenge old ways of thinking and offer new insights; 3) This means that somewhere along the way, I will disagree with people and likewise, they will disagree with me; 4) After I present my paper, I expect that people will challenge me and try to knock the knees out from under my research or to try to poke holes in it; 5) Knowing that I will be challenged by whomever is there, I know that I am going to have to defend myself and debate; 6) I know, however, that this debate will typically not cause strife between myself and whomever challenges me; 7) In fact, I know that when they challenge me (and my work), they are only trying to make me a better researcher, presenter, etc. This is the world I spend the majority of my time in. A world where debating and challenging is the main thrust of discourse. So, take me out of that culture and put me into another one and there is bound to be some struggle. When you spend your life in a culture of argumentation, which I think is VERY healthy and necessary, and then step into another culture, it is often hard to turn off a lot of the other stuff; there is carry-over. Let me give you an example or two of how this can be problematic. Let's say I spend 10 hours on a Monday studying and researching and writing, etc. I spend my whole day debating with commentators and other researchers, etc. about the Bible or how some passage is supposed to be translated or exegeted. Then, at the end of my day, I stop studying and login to Facebook where someone wrongly, I think, cites the passage (e.g. out of context, etc.) on their status. So, I say something on their wall. More than likely, I am going to say it too aggressively or forcefully or something like that. Probably I will come off as arrogant or intimidating, etc. In short, I become the "Awkward Academic". Or, here's another scenario. Let's say I spend 80 hours in the week studying the Bible. Then, on Sunday morning I go to church or on Sunday night to a Bible study. In each of those venues, I hear what I perceive to be someone ripping the verse or passage out of context. All week long I have been conditioned to challenge arguments or debate with scholars, etc. So, unwittingly, I do the same thing in one of these settings. Perhaps I confront the preacher afterwards or write an email to him/her. Or in the Bible study I challenge what the leader says. The fact is, it is quite hard to transition out of one world or culture and into another, where the expectations for discourse are often so different. So, what I hope to work on in the future is how to make that transition more smooth and less rocky. In 2011, I don't want to get closer to being the "Awkward Academic" than I already am. However, I also don't want to downplay education or slack off. Nor do I want to be totally unapproachable by those who might have less education, etc. I just want to be normal, approachable, civil, humble, hospitable and compassionate. That is not to say that I will not speak truth, cave-in to pressures, etc. It just means that I want to find a healthy balance and a good way to transition. That's all.